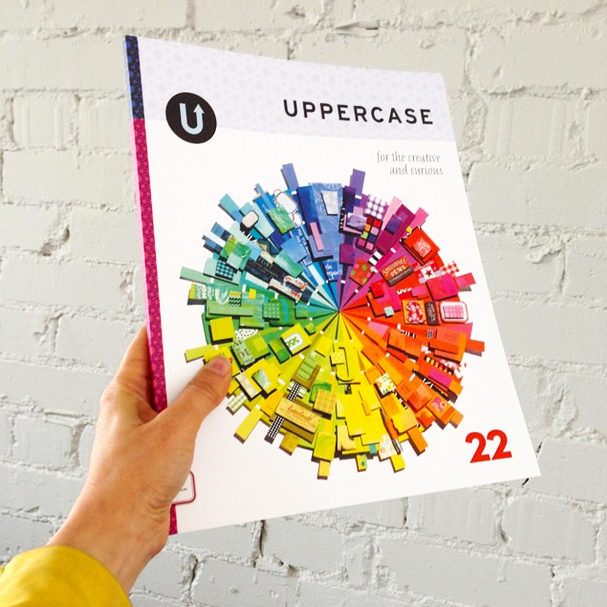 Seriously, have you gotten your subscription to Uppercase! Magazine, yet? It’s one of my favorite things to discover in my mailbox! 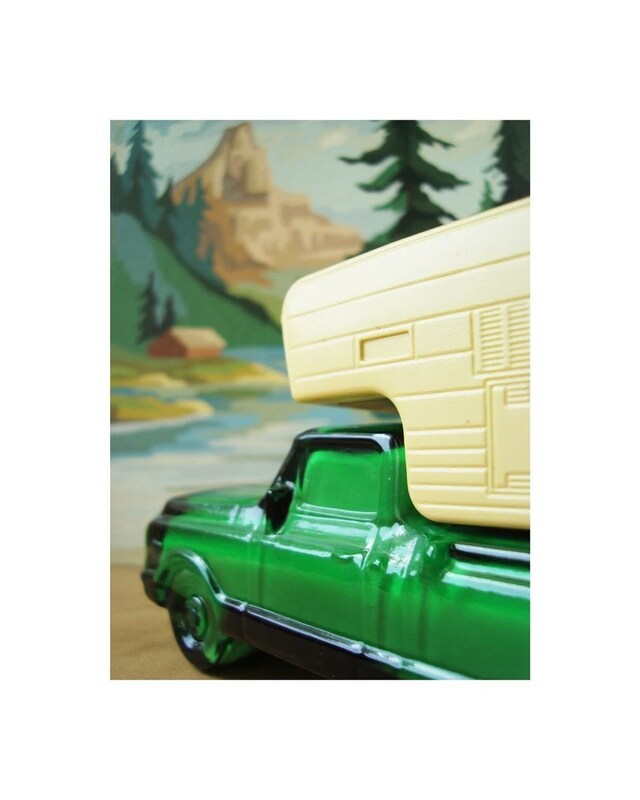 This graphically rich, whimsical, and all-around cornucopia of all things art-related never fails to make me smile. I’ve had such a blast responding to their calls for submission. 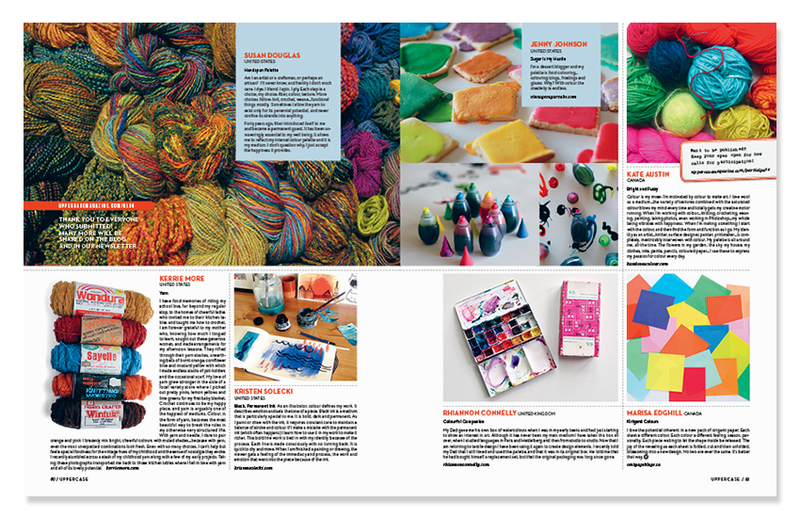 In issue #18, I was lucky enough to have a piece published in their Handsome Ransom feature. That one was so much fun to create! 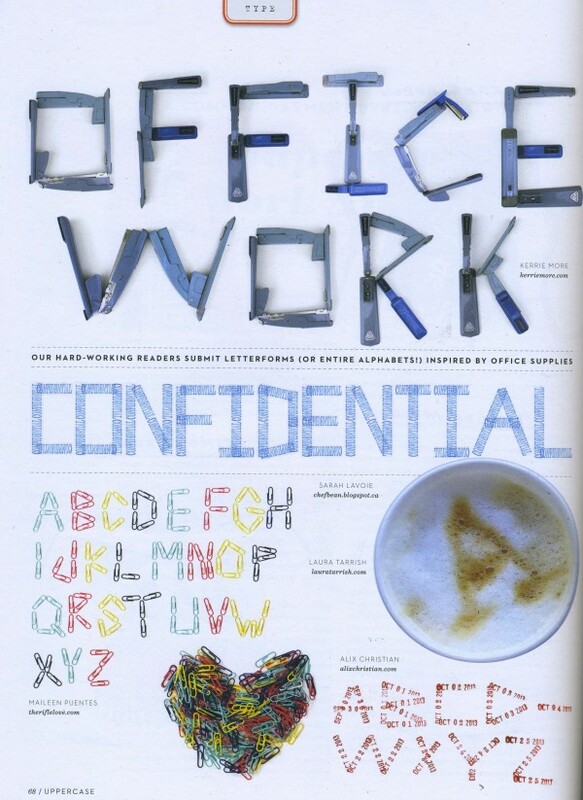 This time, the challenge was a call for letterforms and alphabets made with office supplies. I went out onto my back deck and took some photos of my three vintage staplers in configurations no one had ever imagined before! The result was unique, and my submission was printed right up-front in the feature. 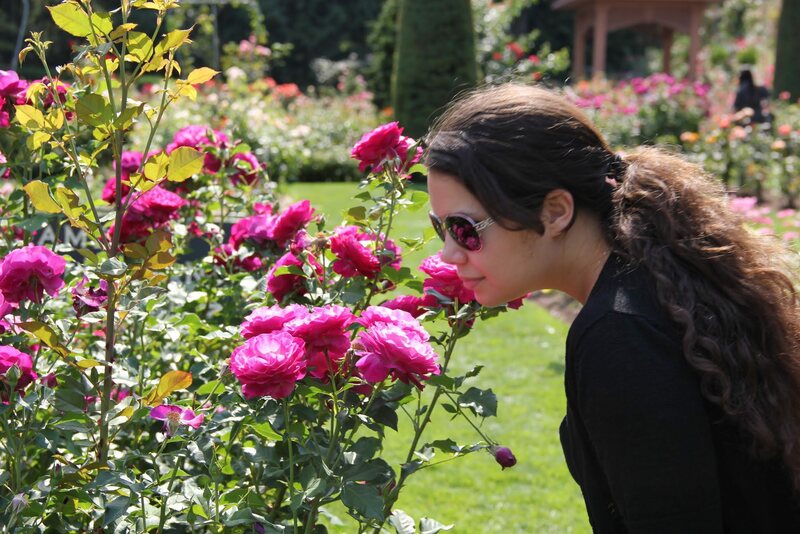 I love the challenges – they give me an excuse to flex my creative skills. 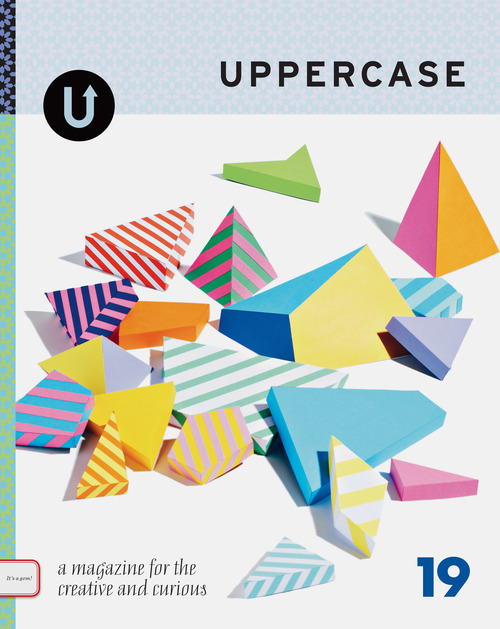 Thanks Uppercase! This recent issue is another visual feast. I love the artist profiles, the interesting feature stories, and of course, the snippets of creative and curious things to look at. Happy Reading and Happy Working! What I love about visiting blogs is that I can connect with like-minded folks with whom I never would have met otherwise. Case-in-point…. my new friend, Mandy. 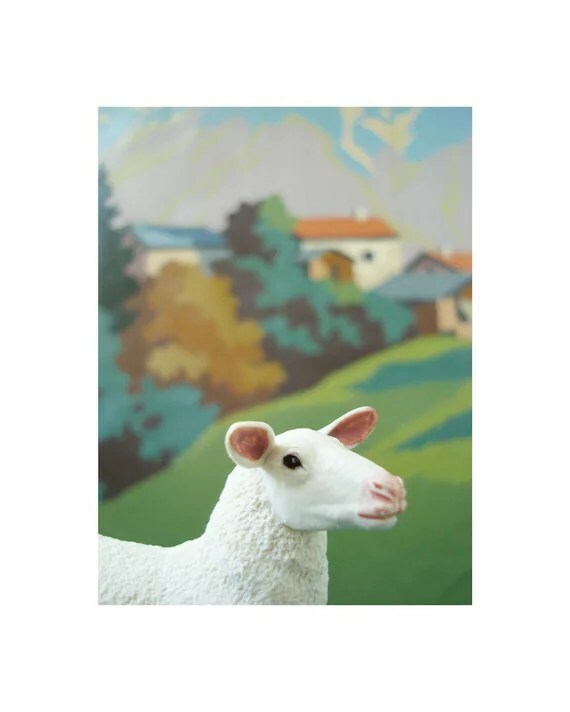 Mandy’s blog, Little Maison, is a lovely feast of art, photography, fashion, decorating, and more. I love absolutely everything she hunts and gathers for her readers! How lucky I am to be able to admire her work, as Mandy lives in Queens, New York, and I live in northwest Montana. 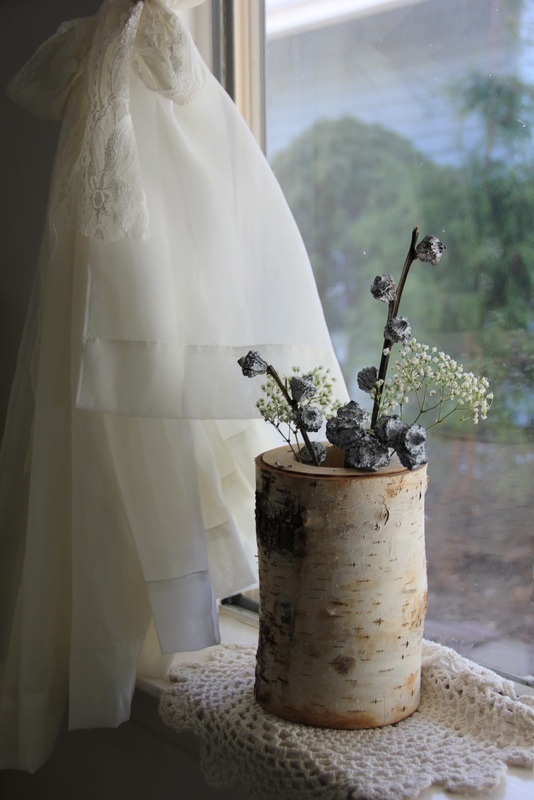 While I have been appreciating all of her inspiration – from vintage wedding attire, locally-made chocolate bunnies, eclectic artwork, beautiful interiors and more… it was her love of books that caught my eye. Mandy is another creative soul who also loves to read, and like me, collect and display beautiful books. It’s all about home for Mandy…. as it is for many of us (from Montana to New York, and everywhere in-between!) 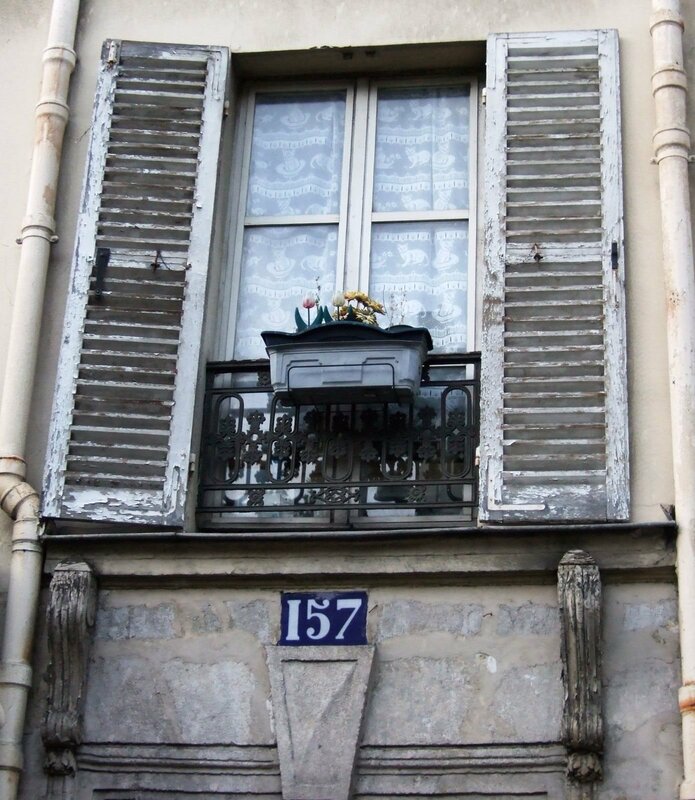 I hope you will drop in to visit her “little maison.” I know you will be as enamored as I am! What creativity do you share with the world I have been in the event planning and marketing industry for 14 years, which is creative but has limitations. I just recently started the blog and it’s been the best thing I’ve done in years! It satisfies my love of writing, photography, fashion and home! Book OR e-reader? Book – but I am a new Nook owner as well! Buy OR lend from the library? Buy. Perhaps it’s the “collector” in me, but I just love purchasing and displaying books for my home. Hardcover OR paperback? Paperback. Hardcovers are too heavy for subway reading in New York City! One book at a time OR several? I was always a one-book-at-a-time gal until recently when I dabbled in a few memoirs at once and loved it! Skip ahead and read the last page OR be patient and wait? Oh, I would like to say patient, but I totally skip ahead! Abandon a bad book OR stick with it no matter what? Abandon. I can’t sit still for a book that won’t hold my interest. Laugh OR cry? I’d much rather laugh with a book, but a good cry from time to time is okay too. 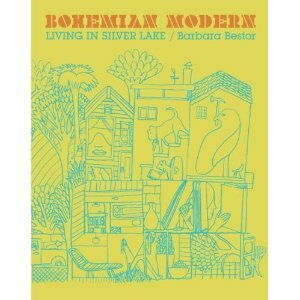 Cover Love: I love the cover of Bohemian Modern: Living in Silver Lake by Barbara Bestor. It’s a vibrant yellow and blue line drawing. It was the first of my design book purchases and still a coffee table favorite. Do you have a favorite genre or genres? I always pick up memoirs first. For years my motto was: the crazier the author, the more attractive. These days, I am reading lighter more inspirational memoirs. What is the next book on your stack of books to read? I just ordered Tout Soul by Karen Wheeler. I fell in love with her memoirs (Tout Soul is her third) over the summer and had the pleasure of interviewing her for my blog. 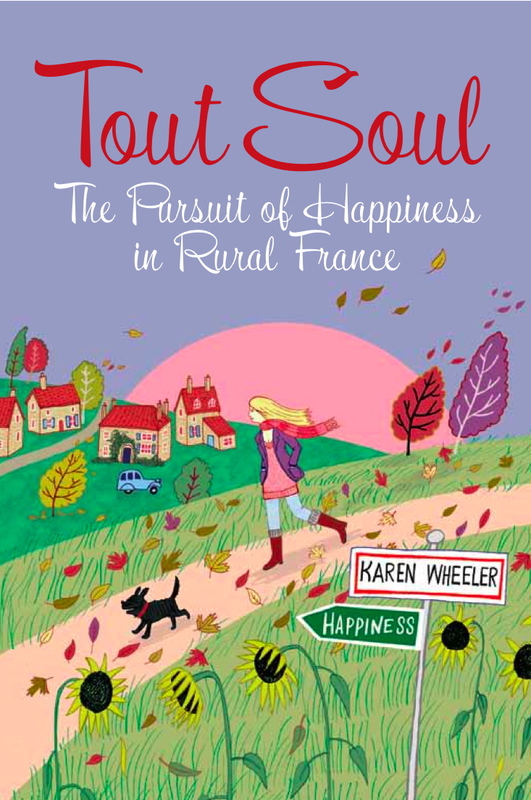 She’s very Bridget Jones but in rural France. Love her! What book have you read in the past year that stands out to you? Slow Love by Dominque Browning stands out the most. 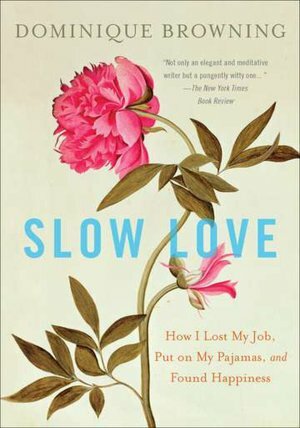 It was a beautiful memoir on how losing her job helped slow down her life, in a good way. It made me laugh out loud, and I literally mailed it to my mother to read the day I was done. She loved it as well. What is your favorite place to read? I typically read in bed. There is something about being cozy in the comforter that makes me speed through pages. Have you ever read a book at exactly the right time of your life? 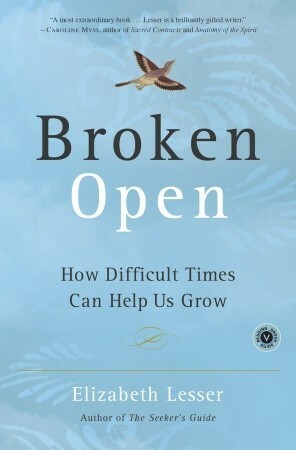 I read Broken Open by Elizabeth Lesser exactly at the right time. It was about change, moving on and personal growth. I was letting go of a bad relationship, and the timing and importance of that book was priceless. Right after I read it, I passed it on to a friend who had just lost her mother. She found the book comforting. Do you have a special book that you like to give as a gift to others? 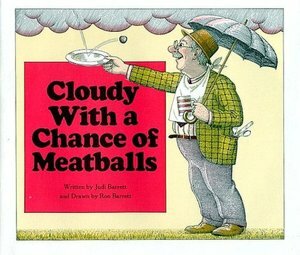 I always buy my favorite childhood book as a gift for my friends’ children, Cloudy with a Chance of Meatballs by Judi Barrett. 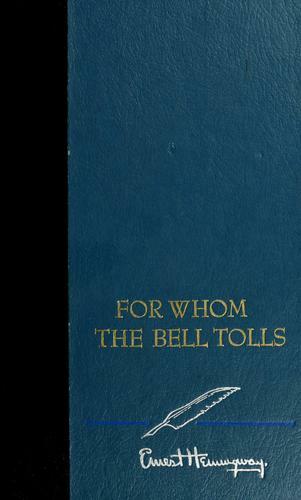 I still remember my father reading it to me, and when I was old enough, I read to him. 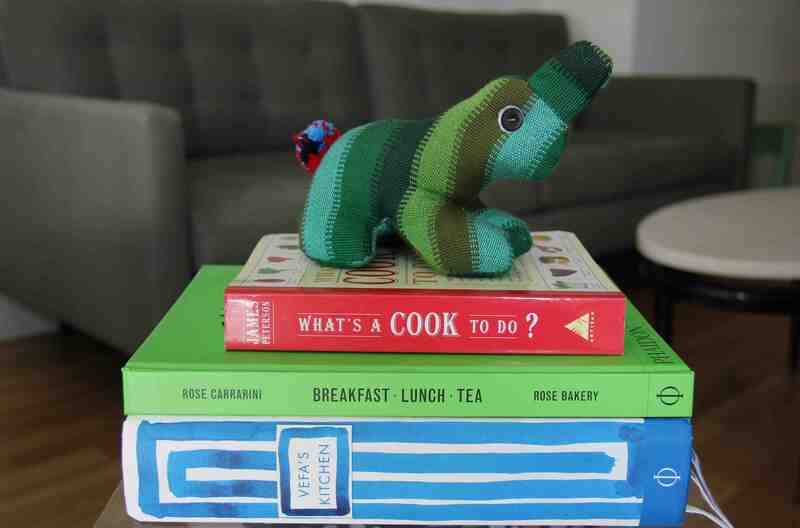 Do you have any books that are special keepsakes? I have 3 hardcover Hemingway books from my Grandmother that are special to me. She always would put a label on the first page which read “from the library of” and she signed her name. I have never read the books (they are on my list) but having the books with her signature is such a wonderful memento. 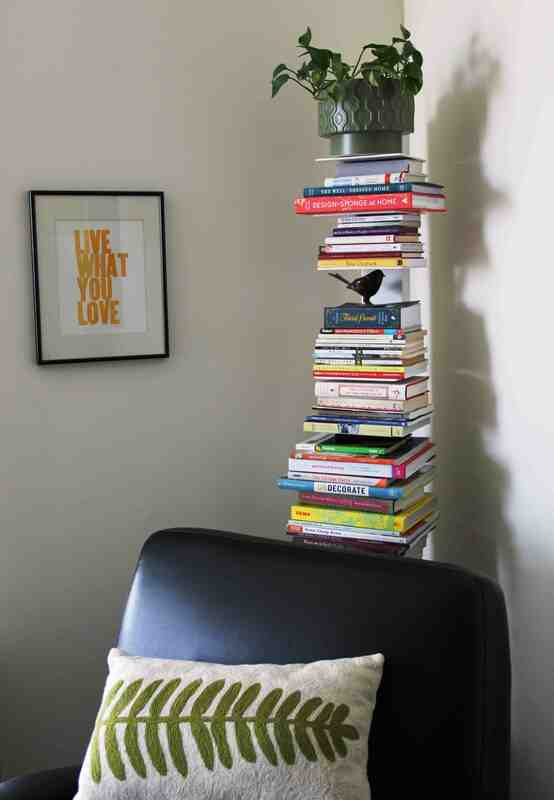 I love to display my books…. Before I moved in with my fiance, George, I had too many books! I had books literally spilling out of every cabinet and closet. I knew I needed to cut down, and I purchased a vertical bookshelf to help organize the mess. I promised myself that I would not exceed the space on the bookshelf, and if I had books that didn’t fit, I’d need to give them to fellow readers. Nowadays it’s a fun thing to rotate out books and give away favorite reads to friends. Thanks, Mandy, for sharing with us your art of reading!